The United States faces an abundance of problems, a weak economy, an abundance of public expenditures, out of control entitlements, and an over-expansive foreign policy, to name a few. These issues are getting worse, not better, with no end in sight. In recent decades, politicians of nearly every conceivable stripe have offered solutions, all to no avail. The only real solution to America’s woes is a return to Jeffersonian principles. 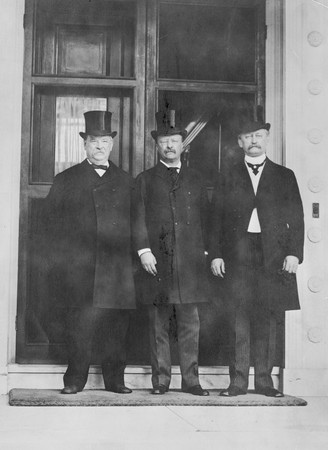 Grover Cleveland, Theodore Roosevelt, and D.R. Francis standing on a porch circa 1903. Courtesy of the POTUS Flickr archive. Since the days of Grover Cleveland, who ended the harsh Panic of 1893 in less than a full term in office, the federal government has used Keynesian economic theory, or intervention, to fight every economic downturn. The results have been less than spectacular. What began as a severe recession in 1929 became the “Great Depression,” the worst economic calamity in American history. Many people will be surprised to learn that the Great Depression came after the government stepped in with its bag of tricks. It did not end until the latter half of the 1940s. After the Panic of 2008, the government bailed out Wall Street to the tune of $700 billion. In 2009, the Obama administration kicked in another $800 billion in a stimulus designed to jump-start the sagging economy. A total of $1.5 trillion in stimulus money has been apportioned. The economy is still in a state of mild depression with a net job loss during the Obama presidency. To restore the republic to prosperity, we must put an end the notion that Washington must provide help in order for the economy to recover. During times of depression, early American Presidents allowed the free market economy to correct itself. As a result, downturns never lasted nearly as long as modern ones have. America is addicted to the paternalistic nature of the federal government, especially towards the poor. The first notions of paternalism arose during the late 19th century, but nothing permanent came from those early ventures. However, beginning with the New Deal and FDR’s failed attempt to fix the depression, the idea that government can provide solutions to problems became more enduring. Another example of the rampant rise in paternalistic philosophy and practice comes with Lyndon Johnson. Johnson built upon FDR’s big government legacy and launched an “unconditional war on poverty” in 1964. The results have been the greatest wealth transfer in human history. More than $16 trillion has been spent on anti-poverty programs to date yet poverty is still an everyday part of American life; the experiment has failed. Jeffersonians, like Cleveland, well understood that once the government began providing assistance to the people, it would never be able to stop providing it. He was right. In addition to its practices at home, Washington has also created a mess with foreign affairs, expanding its paternalistic nature abroad. The US military has ceased to be a force for national defense but has become a “global force for good,” as a current Navy ad proclaims. It’s more akin to an international “meals on wheels” outfit in many regards it seems. Today, the nation’s military has over 900 bases in more than 100 foreign nations. This is ludicrous, especially considering the current weakened state of the US economy. We simply cannot afford these bases, nor is it in our national interests to maintain them. During his second term, internationalists in Congress attempted to pressure President Cleveland to invade and take Cuba, as well as annex Hawaii, an independent nation at that time In both instances, he told them no without hesitation. But Cleveland would be the last President to resist a popular overseas crusade. As a result, America has engaged in reckless foreign policy that seeks perpetual peace by means of perpetual war. We need a President in the mold of Grover Cleveland, who will oppose the economic interventionists, the spending schemes in Congress, and foreign adventurers. To learn more about these important ideals, pick up a copy of The Last Jeffersonian: Grover Cleveland and the Path to Restoring the Republic. This entry was posted in Domestic Policy, History, Jeffersonian Thought, Paternalism and tagged conservative, current affairs, economy, grover cleveland, history, jeffersonian, paternalism, president, the panic. Bookmark the permalink. Great post! Your thoughts are very insightful.